Hiya! 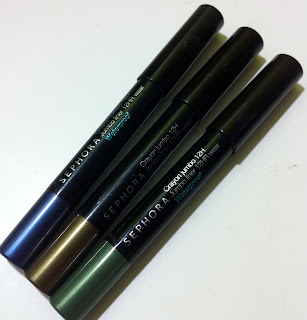 I have some swatches of three Sephora Jumbo Liner 12 Hour Waterproof Pencils to show you! Sephora says: These jumbo pencils create a range of effects, from bold lines and blended effects to thin, defined lines. Resistant to water, heat, and humidity, their creamy, high-pigment formulas apply smoothly. From deep blacks to rich and shimmery shades, each is formulated with exclusive waxes and pigments to assure maximum color intensity that stays put for 12-hours. These are very creamy and you barely have to touch them to the skin to deposit a good amount of color. You have a little time to blend out the color, but once this sets it's not going anywhere. I experience no creasing but a little fading after about 8 hours of wear without a primer, but no problems with fading with a primer. These have black packaging with silver writing. They are a large crayon type pencil that have a colored end so you can see the color in the pencil. These are not self-sharpening, so you need a jumbo-sized sharpener. They are fairly wide, so it is hard to get a thin line, and they work better as an all over lid color. Green Shimmer (number 25) is a very shimmery forest green. Marine (number 13) is a royal blue with a navy base and a little shimmer. Kaki (number 9) is an olive green with a lot of gold in it. The pencils work well as a base to intensify the color of shadow worn over it or on their own. My favorite way to use them is to apply a thick line and then blend it out with my finger. These for $14 for 0.1 oz at Sephora stores. 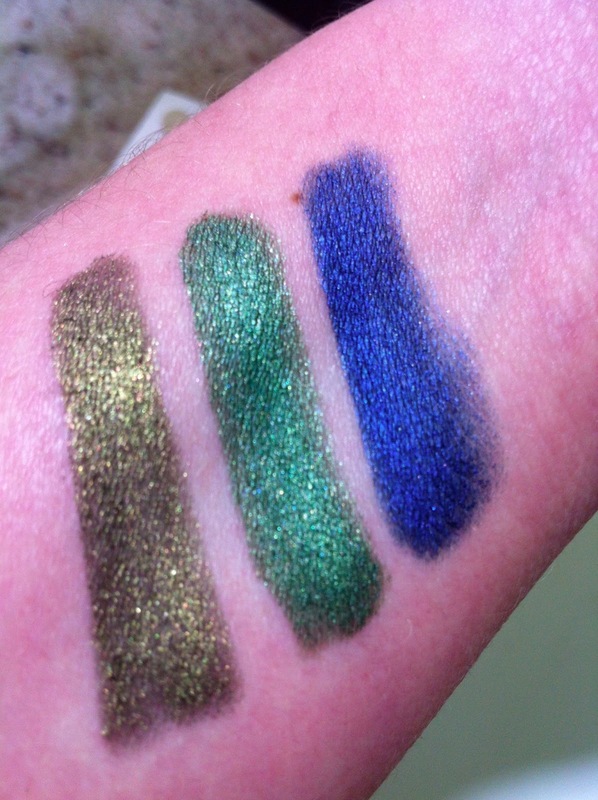 Thanks for checking out my swatches!